Last updated May 15, 2018; see What's New for recent additions and changes. is available in The Derecho FAQ (Frequently Asked Questions) page. A derecho (pronounced similar to "deh-REY-cho" in English, or pronounced phonetically as " ") is a widespread, long-lived wind storm. Derechos are associated with bands of rapidly moving showers or thunderstorms variously known as bow echoes, squall lines, or quasi-linear convective systems. Although a derecho can produce destruction similar to that of a tornado, the damage typically occurs in one direction along a relatively straight path. As a result, the term "straight-line wind damage" sometimes is used to describe derecho damage. By definition, if the swath of wind damage extends for more than 250 miles (about 400 kilometers), includes wind gusts of at least 58 mph (93 km/h) along most of its length, and also includes several, well-separated 75 mph (121 km/h) or greater gusts, then the event may be classified as a derecho. Recently, an updated definition of "derecho" was proposed. The primary aim of this work is to make the definition more physically-based, i.e. focused on the meteorological processes believed responsible for the production of organized, damaging surface winds. 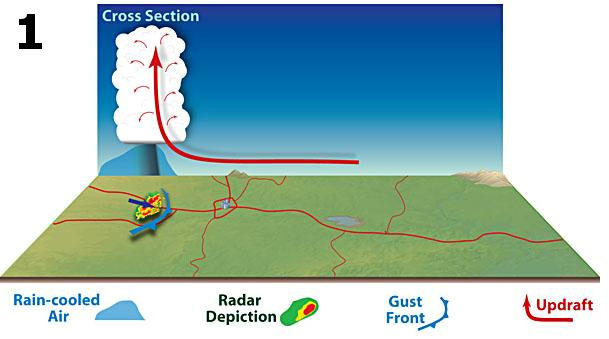 The proposal requires the presence of certain radar-observed storm structural features such as bow echoes and rear-inflow jets (discussed below in Derecho-producing storms and Derecho development). The length requirement in the proposed definition was increased to 650 km (400 miles), while the requirement for specific observed wind gusts was dropped. Origin of the term "derecho"
The word "derecho" was coined in 1888 by Dr. Gustavus Hinrichs, a professor of physics at the University of Iowa. Hinrichs used the term in a paper published by the American Meteorological Journal to distinguish thunderstorm-induced straight-line winds from the damaging, rotary winds of tornadoes. "Derecho" is a Spanish word meaning "right," "direct," or "straight ahead." (Click here to hear a pronunciation of the word "derecho"). In contrast, the word "tornado" is thought to have been derived from the Spanish word "tornar," which means "to turn." Because "derecho" is of Spanish origin, the plural form is spelled "derechos;" i.e., the letter "e" is not added after the letter "o." A defining excerpt from Hinrich's paper may be seen in this figure that shows a derecho crossing Iowa on July 31, 1877. "Derecho" was adopted to a limited extent by the meteorological community during the 1880s. However, the word disappeared from use for nearly a century until it was resurrected by NOAA National Severe Storms Forecast Center (predecessor of the Storm Prediction Center) meteorologists Robert Johns and William Hirt in a 1987 paper that described derechos over the central and eastern United States. Ray Wolf, of the Davenport, Iowa National Weather Service Forecast Office, created a web page about Gustavus Hinrichs. The page provides information on Hinrichs' background, and on his introduction of the term "derecho" in the late 1800s. Wolf's page also briefly discusses how the term "derecho" has come into more common use in recent years. As mentioned above, by the present definition, derecho winds must meet the National Weather Service criterion for severe wind gusts (greater than 57 mph) at most points along the storm path. But in stronger derechos, winds may exceed 100 mph. For example, as a derecho roared through northern Wisconsin on July 4, 1977, winds of 115 mph were measured. More recently, the derecho that swept across Wisconsin and Lower Michigan during the early morning of May 31, 1998 produced a measured wind gust of 128 mph in eastern Wisconsin, and estimated gusts up to 130 mph in Lower Michigan. The winds associated with derechos are not constant and may vary considerably along the derecho path, sometimes being below severe limits (57 mph or less), and sometimes being very strong (from 75 mph to greater than 100 mph). This is because the swaths of stronger winds within the general path of a derecho are produced by what are called downbursts, and downbursts often occur in irregularly-arranged clusters, along with embedded microbursts and burst swaths. Derechos might be said to be made up of families of downburst clusters that extend, by definition, continuously or nearly continuously for at least 250 miles (about 400 km). The derecho of July 4-5, 1980 is a good example of an event that exhibited wide variation in observed wind speeds due to embedded microbursts, downbursts, and downburst clusters. More on microbursts, downbursts, and downburst clusters may be found in Derecho-producing storms. Because derechos are most common in the warm season, those involved in outdoor activities are especially at risk. Campers or hikers in forested areas are vulnerable to being injured or killed by falling trees, and those at sea risk injury or drowning from storm winds and high waves that can overturn boats. Occupants of cars and trucks also are vulnerable to falling trees and utility poles. Further, high profile vehicles such as semi-trailer trucks, buses, and sport utility vehicles may be blown over. At outside events such as fairs and festivals, people may be killed or injured by collapsing tents and flying debris. Even those indoors may be at risk for death or injury during derechos. Mobile homes, in particular, may be overturned or destroyed, while barns and similar buildings can collapse. People inside homes, businesses, and schools are sometimes victims of falling trees and branches that crash through walls and roofs; they also may be injured by flying glass from broken windows. Finally, structural damage to the building itself (for example, removal of a roof) can pose danger to those within. Another reason that those outdoors are especially vulnerable to derechos is the rapid movement of the parent convective system. Typically, derecho-producing storm systems move at speeds of 50 mph or greater, and a few have been clocked at 70 mph. For someone caught outside, such rapid movement means that darkening skies and other visual cues that serve to alert one to the impending danger (e.g., gust front shelf clouds --- see photos elsewhere on this page) appear on very short notice. In summary, the advance notice given by a derecho often is not sufficient for one to take protective action. 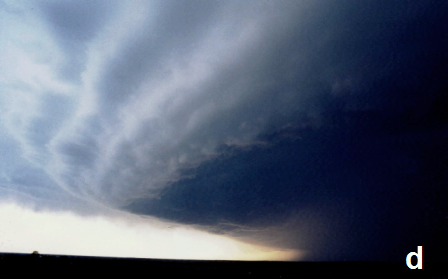 - A camper's close brush with death during the July 4-5, 1999 derecho in Maine. - A boater's encounter with the May 17, 1986 derecho on Lake Livingston, Texas. - A dramatic account of a boat overturned by intense straight-line winds during a July 1943 wind storm near Goshen, Indiana. For a more comprehensive view of derecho hazards, the "Noteworthy Event" page for the July 4-5, 1980 derecho lists the cause of death or injury for the 73 casualties of that event, providing a typical example of the risks to humans posed by derechos. Whether in an urban or rural area, those out-of-doors are at greatest risk of being killed or injured in a derecho. But of particular significance in urban areas is the vulnerability of electrical lines to high winds and falling trees. In addition to posing a direct hazard to anyone caught below the falling lines, derecho damage to overhead electric lines sometimes results in massive, long-lasting power outages. Hundreds of thousands of people may be affected; in the worst events, power may not be restored for many days. It is the complex and dense concentration of overhead distribution feeders in urban areas --- and their frequent proximity to large trees --- that make cities especially vulnerable to electrical outages following wind storms. The density and mileage of overhead electric distribution lines in urban areas far exceeds that of any rural or exurban area. Pole lines often carry multiple circuits and voltages, as well as lines for street lighting and customer service connections that further add to their vulnerability. Because of this, and because urban electrical feeders typically serve smaller territories relative to their rural counterparts, significantly greater manpower is necessary to restore service after major storms. In addition, unlike the localized damage produced by a tornado, derecho damage may be widespread. As a result, repairs often require greater effort, with additional delays related to shortages in supplies. Cities in which derechos have resulted in prolonged power outages include Baltimore (June 29, 1980), Kansas City (June 7, 1982), and Memphis (July 22, 2003). More recently, the Ohio Valley / Mid-Atlantic derecho of June 29, 2012 caused protracted, widespread power outages in cities from Cincinnati, Columbus, and Dayton to Atlantic City, Baltimore, and Washington, D.C. There also is evidence to suggest that the impact posed by derechos has increased in recent years due, in part, to the maturation of shade trees planted in suburban areas in the 1950s and 1960s. The vast tracks of post-war suburbs, with their overhead utility lines and older trees, are especially vulnerable to damage from high winds of any source. Derechos are associated with bands of showers or thunderstorms (collectively referred to as "convection") that assume a curved or bowed shape. The bow-shaped storms are called bow echoes. Bow echoes typically arise when a storm's rain-cooled outflow winds are strong, and move preferentially in one direction. A derecho may be associated with a single bow echo or with multiple bows. Bow echoes, in turn, may consist of an individual storm, or may be composed of a series of adjacent storms (i.e., a squall line or, more formally, a quasi-linear convective system) that together take on a larger scale bow shape. Bow echoes may dissipate and subsequently redevelop during the course of given derecho. Derecho winds occasionally are enhanced when a rotating band of storms called a bookend vortex develops on the poleward side of the bow echo storm system. Derecho winds also may be augmented by the presence of embedded supercells (rotating thunderstorms) and other smaller-scale circulations in the derecho-producing convective system (see Tornadoes and Other Circulations). As noted previously, derecho winds are the product of what meteorologists call downbursts. A downburst is a concentrated area of strong wind produced by a convective downdraft. Downbursts have horizontal dimensions of about 4 to 6 miles (8 to 10 kilometers), and may last for several minutes. The convective downdrafts that comprise downbursts form when air is cooled by the evaporation, melting, and/or sublimation (the direct change to vapor phase) of precipitation in thunderstorms or other convective clouds. Because the chilled air is denser than its surroundings, it becomes negatively buoyant and accelerates down toward the ground. Derechos occur when meteorological conditions support the repeated production of downbursts within the same general area. The "downburst clusters" that arise in such situations may attain overall lengths of up to 50 or 60 miles (80 to 100 kilometers), and persist for several tens of minutes. Within individual downbursts there sometimes exist smaller pockets of intense winds called microbursts. Microbursts occur on scales (approximately 2 1/2 miles or 4 km) that are very hazardous to aircraft; several notable airline mishaps in recent decades resulted from unfortunate encounters with microbursts. Still smaller areas of extreme wind within microbursts are called burst swaths. Burst swaths range from about 50 to 150 yards (45 to 140 meters) in length. The damage they produce may resemble that caused by a tornado. 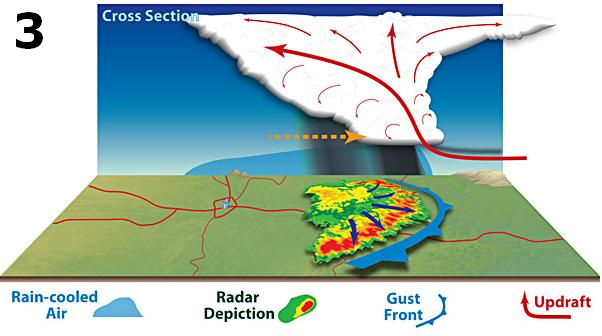 A typical derecho consists of numerous downburst clusters ("families of downburst clusters") that are, in turn, composed of many smaller downbursts, microbursts, and burst swaths. The schematic below illustrates the scalar relationships between these features. The development of a thunderstorm's downdraft ordinarily marks the dissipation stage of that particular storm. But air forced up along a gust front can give birth to new thunderstorms. As new storms mature, the rain they produce reinforces the existing "pool" of rain-cooled air produced by earlier storms, allowing the gust front to maintain its strength. As this cold pool increases in size and elongates in the direction of the mean wind, it may induce an inflow of air known as the rear-inflow jet (dashed brown arrow in figure below) on the trailing side of the thunderstorm complex. This causes the updraft to tilt toward the rear side of the storm (i.e., to the left in the figure). Tilting of the updraft allows the thunderstorm to further expand, increasing the aerial coverage of the rain. This, in turn, adds to the pool of cold air accumulating beneath the storm and strengthens the gust front, causing it to bow outward in the downwind direction. The resulting acceleration in forward motion of the gust front subsequently forces more warm, moist air upward, creating still more storms, and the process repeats. The rain produced by the newer storms reinforces the cold pool, strengthening the inflow of air from the back side of the developing storm complex and encouraging the downward transport of higher momentum air from aloft. These processes can enable the system to attain a nearly steady-state condition. At this point, the convective system typically exhibits a pronounced bow shape on radar (see figure below) and satellite, with an area of moderate to occasionally heavy rain located near the center of the cold pool, well behind the arc of intense rain immediately behind the gust front. 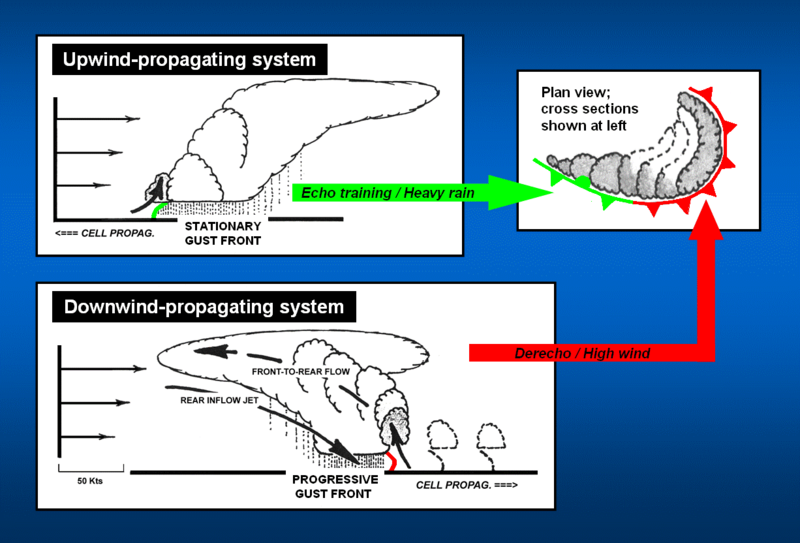 As long as the thermodynamic and kinematic environments support the continued development of new thunderstorm cells in the downwind direction along the advancing gust front --- a process known as downwind or "forward" propagation --- the convective complex will persist, along with the potential for downbursts and microbursts. An animated, visible data satellite view of a derecho-producing convective system appears below. This particular event (May 31, 1994) occurred in a relatively dry environment over Utah and western Wyoming. Because of this, there was minimal supplementary cloud cover that tends to obscure the active storm towers of systems occurring in more moist regimes. As a result, the case well-illustrates the process of forward propagation along a convective system gust front. As the arc-shaped gust front advances from southwest to northeast across Utah, the rapidly-growing, new updrafts appear as sharply-outlined whitish clumps (cumulus and cumulonimbus clouds). These stand in marked contrast to the more fibrous debris clouds (cirrus "anvils") that are left behind as the gust front continues northeastward, undercutting the older updrafts and severing their link to warm, buoyant air. The derecho-producing convective system is therefore seen to be composed of a series of discrete, downwind-developing, wind-producing thunderstorms. More on thunderstorm propagation and the impact of propagation on the predominant storm hazards posed follows in the next section. On occasion, on the rear flank of a convective system responsible for a derecho, a nearly stationary band of thunderstorms may form. If such a band persists for an extended period, and/or if the line forms in a region of rocky or steeply-sloped terrain, flash flooding may follow. Situations of this type are not common, but when they do occur, the results may be devastating as the convective system's high winds are followed by the ravages of flooding. The "Ohio Fireworks" derecho-flash flood of July 4, 1969 is an example of what might be termed a concurrent derecho-flash flood convective system. Eighteen people died, many others were injured, and widespread destruction occurred as derecho winds swept across Michigan, Ohio, Pennsylvania, and adjacent Lake Erie. A few hours later, more than two dozen people perished from subsequent flash flooding in Ohio. The Johnstown, Pennsylvania flood of July 20, 1977 was associated with a similar convective system that produced both flash flooding and high winds. As a cold pool in unidirectional environmental flow further elongates, the trailing, upwind flank of its gust front often becomes stationary or nearly so. This is shown in the right-most plan-view of the illustration above and in the plan-view inset of the figure below by the green-colored part of the outflow boundary, and by the alternating warm and cold frontal pips. Trailing gust front boundaries are especially likely to become stationary when the atmosphere is moist through a very deep layer, and the potential for strong, evaporatively cooled storm downdrafts is, therefore, comparatively limited. The persistent source of low-level uplift provided by the stalled gust front can then serve as the seat of repetitive thunderstorm development in the upstream direction. As individual storms grow and mature, they move parallel to the boundary, causing multiple episodes of heavy rain at locations along the line. Such convective evolution is known as echo training. Prolonged echo-training in a moisture-rich environment nearly always results in excessive rainfall or flash flooding. Smaller scale or more intermittent episodes of echo training frequently occur on the rear flanks of derechos, and may cause localized flooding in the wake of a derecho's high winds. In addition, back-building lines of storms sometimes form atop the cold pool left in the wake of a derecho; the combined derecho-heavy rain producing storm structure is then known as a bow-arrow convective system. More information on the relationship between derechos and flash-flood producing convective systems is available here. Some of the most intense summer derechos, especially those of the progressive type (see below), occur on the fringes of major heat waves. Examples include the July 1983 "I-94" derecho in the upper Mississippi Valley, the Mid-July 1995 derechos in New York and Canada, and the more recent Ohio Valley / Mid-Atlantic derecho of June 2012. The relationship is more than statistical. It turns out that the meteorological conditions favorable for large-scale heat waves often also are conducive to derechos. In the United States, this is especially true from the Upper Missisippi Valley and Upper Great Lakes into the Ohio Valley and Northeast. The primary link between heat waves and derechos is the presence of an elevated mixed layer, or EML. An EML is a layer of mid-tropospheric air that originates over the arid, elevated terrain. Because of their origin, EMLs exhibit sharp decreases in temperature with height. The large vertical temperature differentials (or "steep" lapse rates) in EMLs are analogous to those observed over black-topped roofs and parking lots on sunny days. Such thermal stratification encourages the formation of strong updrafts that can lead to the development of thunderstorms. In fact, the frequent presence of an EML on days othwerwise favorable for thunderstorm formation to a large extent accounts for the intensity of the storms commonly encountered over the Great Plains. During a typical heat wave over the central and eastern United States, a large, stationary upper-level high pressure area usually is present over the south-central states. Persistent westerly winds on the poleward side of the high allow EMLs generated over the Rocky Mountains to extend eastward into the Ohio Valley and Northeast, well beyond their usual range over the Plains. Warm air aloft associated with the base of the EML acts as a "cap" or "lid" that prohibits thunderstorm development along much of the extent of the EML, southward into the heat wave-associated "high." But on the northern fringe of the EML, where low-level uplift frequently is focused along a stationary front marking the northern edge of the heat wave, updrafts that form in the strongly heated air near the ground may breach the cap, resulting in an explosive release of instability. If other conditions are favorable (e.g., low-level moisture is abundant along the front, winds are largely unidirectional, parallel to it, and increase with height), additional storms may erupt in concentrated fashion along the boundary, yielding a band of downstream-developing storms and, on occasion, a full-blown derecho. The illustration below illustrates the idealized, large-scale meteorological environment favorable for progressive derechos on the northern fringe of a quasi-stationary high pressure cell associated with a major heat wave over central and eastern United States. 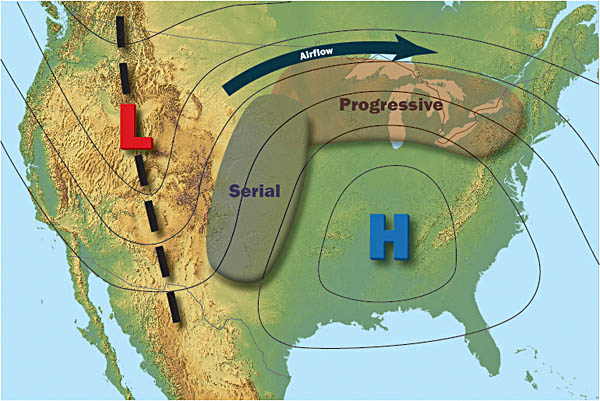 The location of the EML in such situations is approximated by the brown-tinted band behind the word "Progressive," with the mean mid-tropospheric flow depicted by the arrow marked "Airflow," and the high pressure center by an "H." The region most susceptible to serial-type derechos in such a pattern also is shown. Two primary forms of derechos may be distinguished. This classification largely is based on the overall organization and behavior of the associated derecho-producing convective system and reflects, in part, the dominant physical processes responsible for the thunderstorms and damaging surface winds. The type of derecho most often encountered during the spring and fall is called a serial derecho. These are produced by multiple bow echoes embedded in an extensive squall line (typically many hundreds of miles long) that sweeps across a very large area, both wide and long. This type of derecho typically is associated with a strong, migratory low pressure system with strong low- to mid-tropospheric flow. An example of a serial derecho with a very extensive squall line and embedded smaller scale bow echoes is the one that affected Florida, Cuba, and adjacent parts of the Gulf of Mexico, the Caribbean Sea, and the Atlantic Ocean during the early stages of the "Storm of the Century" on March 12-13, 1993. The second type of derecho is called a progressive derecho. These are associated with a relatively short line of thunderstorms (typically from 40 miles to 250 miles in length) that may at times take the shape of a single bow echo, particularly in the early stages of development. In some cases, the width of a progressive derecho and its associated bow echo system remain relatively narrow even though they may travel for hundreds of miles. An example of this type is the "Boundary Waters-Canadian Derecho" that occurred on July 4-5, 1999. In other cases, the progressive derecho and associated bow echo system begin relatively small, with a narrow path, but over time grow to exceed 250 miles in width. The line of thunderstorms of a progressive derecho often begins as a single bow echo that evolves into a short squall line, typically with more than one embedded bowing segment. Such development occurred with the "I-94 Derecho" over the north-central United States on July 19, 1983 (see Fig. 2 in that event's discussion page). Progressive derechos may travel for many hundreds of miles along paths that are relatively narrow compared to those of serial derechos. They sometimes are associated with an area of weak low pressure at the surface. However, the low- to mid-tropospheric flow in the neighborhood of progressive systems typically is not strong, suggesting that, in contrast to serial-type events, the intense surface winds observed result more from storm-induced downdrafts than from the downward transfer of fast mid-tropospheric flow. Occasionally, derechos having characteristics of both serial and progressive events are observed. These events are known as hybrid derechos. For example, the "Southern Great Lakes Derecho of May 30-31, 1998 was attendant to a strong, migrating low pressure system. However, the derecho path and the associated bow echo convective system had many characteristics of a progressive derecho. Most derecho-producing thunderstorm systems originate in and/or move through areas of seasonably rich low-level moisture. For example, nearly all the cases included in Noteworthy Events occured with surface dewpoints at or above 70° Fahrenheit. In contrast, bands of widespread wind-producing storms sometimes form in environments of very limited moisture, for example, with dewpoints in the 40s or low 50s (°F). Such systems are known as low-dewpoint derechos. Low-dewpoint derechos most often occur between late fall and early spring in association with strong low pressure systems, and are a form of hybrid derecho. On occasion they appear during the warmer half of the year, especially in drier regions. The May 31, 1994 Utah-Wyoming derecho shown in the animated satellite loop in Derecho Development (above) is an example of a low-dewpoint event. This system produced a 105 mph wind gust at Provo, Utah, where sixteen people were injured, and severely damaged the Saltair Pavilion on the Great Salt Lake. A wind gust of 140 mph was measured on Camelback Mountain in nearby Dugway Proving Ground. Surface dewpoints were in the mid-40s °F along the path of the storm. Low-dewpoint derechos are essentially organized bands of successive, dry downbursts or microbursts. Some low-dewpoint systems appear to be ordinary serial-type events that happen to form in drier-than-average environments, while others more closely resemble progressive derechos, producing serial, convectively-driven downdrafts. More information on derechos in environments of limited moisture is available here. Reduced to simplest terms, a derecho-producing convective system consists of a line of downstream-replicating, ordinary thunderstorm cells. Forecasting derechos begins, therefore, with examination of the atmospheric environment to assess the likelihood for the sequential development of individual thunderstorms, and, in particular, thunderstorms that might produce strong surface winds. Thunderstorms are reasonably well-forecast; the processes governing their formation have been fairly well-understood for the better part of a century. In contrast, derecho forecasting remains one of the most challenging tasks facing operational meteorologists today. This difficulty reflects two primary limitations: (1) the imprecise nature of the observational network (relative that necessary) to produce an accurate and detailed picture of the propensity for thunderstorms with strong surface winds, and (2) our incomplete understanding of the processes that lead to repetitive, linearly-organized storm development. Many meteorological factors, some acting synergistically and some seemingly at odds, may come together to yield an environment conducive to derechos. The variation of these factors over space and time also is important in fostering or hindering development. Two nearly identical meteorological settings at a given location might yield vastly different outcomes --- that is, a derecho or no derecho --- depending upon how the atmosphere evolved to that point in time, and how conditions vary spatially around that location. Derecho formation also is dependent upon very small-scale processes involving condensation, melting, evaporation, and sublimation of water deep within rapidly changing clouds --- processes that are neither well-understood, nor readily observable. In some ways, serial derechos are easier to forecast than progressive events because the primary forcing mechanisms responsible for their development (e.g., strong cold fronts or jet stream disturbances) are fairly well sampled by today's observing network. On the other hand, unlike many other significant weather events of any type, progressive derechos may arise in relatively benign large-scale environments, with little or no identifiable atmospheric forcing. Many progressive derechos, in fact, arise in a manner that might best be described as a form of "atmospheric boot-strapping," wherein seemingly random interactions between individual thunderstorm cells --- or a loosely organized group of cells --- sometimes lead to a much larger, more strongly-organized system. One factor that appears important in realizing such development is the release of very strong latent heating in a relatively confined region. This may occur through the simultaneous development of many vigorous individual thunderstorm cells near a weak front or other local lifting mechanism. Such latent heating involves the lofting of abundant rain, snow, and hail particles that can lead to the rapid formation of strong storm downdrafts and an expanding cold pool. The "Super Derecho" of May 8, 2009 is an example of a storm that exhibited this type of development. Recent research has to some extent furthered our understanding of mechanisms behind repetitive, downstream thunderstorm development, and studies have shed light on the origins of strong winds in convective storms (e.g., the BAMEX program of 2003; see References). In addition, numerical forecast models exist that have, on occasion, correctly depicted derecho development. But significant advances in forecast skill likely will require deployment of a nationwide network of atmospheric sensing devices with greatly enhanced spatial and temporal resolution relative to that in place today --- in addition to further storm-scale research. Once a derecho has formed, the forecast task reduces to determining where the parent convective system will move, and how long will it last. 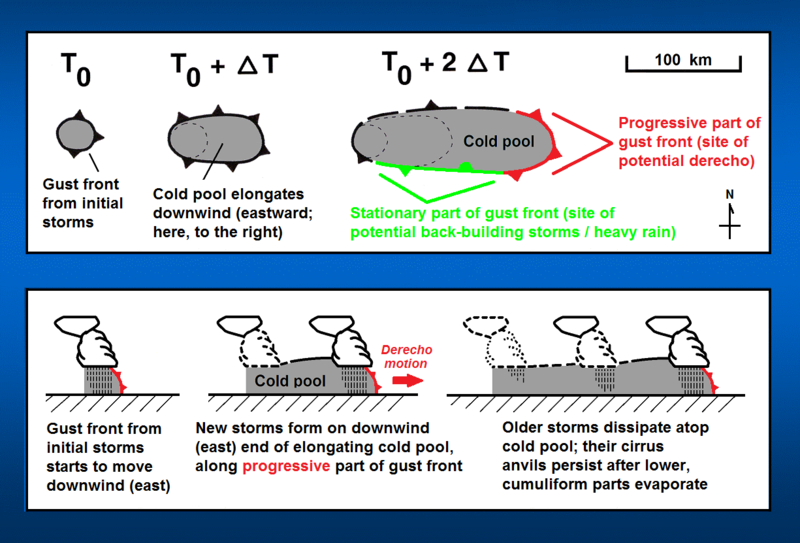 As noted in Derecho Development, a derecho will persist as long as the environment on the downwind side of its elongating cold pool is favorable for the formation of new storms. But both the location and rate of new storm development in the downwind direction typically vary over space and time, with factors such as the distribution of low-level moisture, atmospheric instability, and "capping" (warm layers aloft that hinder storm formation) --- amongst others --- typically involved. Such variables complicate the forecast process. At the same time, the background wind field around a derecho rarely remains static. Because the overall motion of a derecho-producing convective system is a combination of (1) advection (the movement of individual storm cells by the environmental wind outside the storms), and (2) propagation (the development of new storm cells relative to older ones), spatial and/or temporal changes in the environmental wind add further complexity to the forecasting of derecho tracks. Various parameters and techniques have been developed in recent years to help forecast derecho formation, movement, and longevity (see References). These tools will require modification as observational and modelling studies provide further understanding of derecho mechanics. Derechos and tornadoes can occur with the same convective system. This is particularly so with serial derechos associated with strong, migratory low pressure systems. The tornadoes may occur with isolated supercells (rotating thunderstorms) ahead of the derecho producing squall line, or they may develop from storms within the squall line itself. An example of a serial derecho that produced both extremely damaging straight-line winds and significant tornadoes from supercells embedded in the derecho-producing squall line is that which affected Florida during the early stages of the so-called "Storm of the Century" of March 12-13, 1993. Although not as common, tornadoes sometimes occur with progressive derechos. When they do, the tornadoes typically form within the bow echo storm system itself, and only rarely are associated with isolated supercells ahead of the bow. The occurrence of tornadoes with derecho-producing convective systems reflects the fact that both tornadoes and strong convective wind gusts share, to some extent, common origins in the background atmospheric environment. In short, the great degree of thermodynamic instability; i.e., buoyancy, that gives rise to strong updrafts and, ultimately, the thunderstorms that spawn tornadoes also promotes the formation of storm downdrafts. In addition, both tornado and derecho environments are characterized by the presence of substantial vertical wind shear; i.e., large changes in wind speed and/or direction with height. While derecho-producing convective systems tend to be most favored when the vertical wind profile is unidirectional, a unidirectional wind profile may still contain appreciable shear. At the same time, in even a modestly sheared environment, small-scale stretching and tilting motions often present along storm gust fronts in a squall line may yield low-level circulations that, on occasion, can "tighten up" into a tornado. While storm downdrafts likely account for the greater proportion of damaging nontornadic winds in a derecho-producing convective system, observational evidence and numerical simulations show that corridors of enhanced wind damage in derecho-producing squall lines often are associated with embedded circulations or "vortices." These features may occur in various sizes and generally are referred to as mesovortices. Mesovortices can arise in many ways. For example, the bookend vortices mentioned in Derecho-producing storms are counter-rotating circulations that arise as the rear-inflow jet of a developing convective system impinges on the system's gust front (see Derecho development). This forces horizontally-rotating "tubes" of air along the gust front to tilt vertically in storm updrafts on either side of the jet. Once formed, the pair of resulting vortices can enhance the rear-inflow jet and thereby initiate or accelerate the bowing process, as shown here. Bookend circulations may reach dimensions of several tens of miles. Counter-rotating vortices also occasionally arise from the downward tilting of horizontal vorticity by storm downdrafts, as shown in the following schematic modified from this study by Wakimoto et al. The horizontal vortex tubes (here depicted by green arrows) arise from differencies in buoyancy strength (that is, the tendency for spontaneous upward motion) across a thunderstorm or squall line's gust front. Smaller circulations on the order of a mile or two in diameter sometimes develop along gusts fronts as a result of what is known as horizontal shear instability. This form of instability is derived from the very sharp changes in wind direction and speed that exist across such boundaries. When the background wind shear and/or buoyancy are great, shear-induced vortices sometimes sufficiently strengthen to produce tornado-like damage. 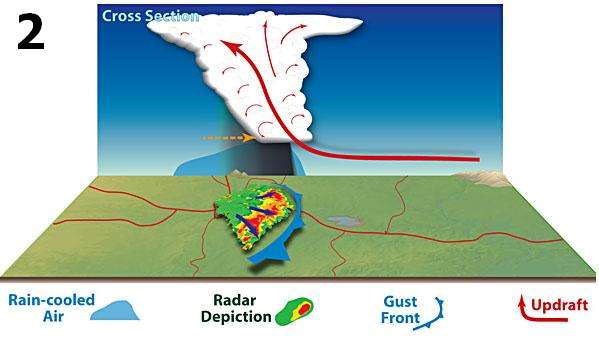 Many such features accompanied the "Super Derecho" of May 8, 2009 (see Figure 4). 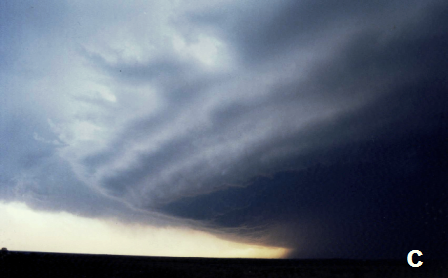 Mesocirculations in some derecho-producing convective systems also may be traced to supercell storms that were present during the early stages of system development and subsequently were absorbed within it (e.g., see the "People Chaser Derecho" of 2001). 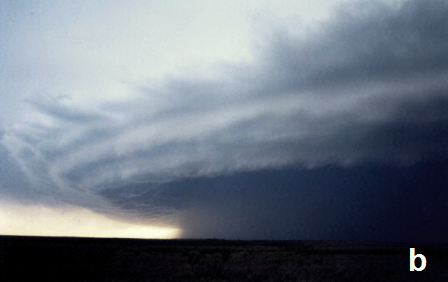 Similar circulations appear when an accelerating line or bow echo overtakes a more slowly-moving supercell storm. The split-panel illustration below shows several mesovortices along a derecho-producing squall line as viewed by Doppler radar. The left panel shows radar reflectivity, the right, radar velocity; the radar location is depicted by the black circles at the top left in both panels. Vortices 1 and 2 are small-scale circulations that may have arisen due to the presence of strong horizontal shear along the gust front. Green and blue shades in the velocity panel indicate air moving toward the radar; red and orange, air moving away. Vortex 3 is larger, but not as well-organized. Animated reflectivity data (not shown) suggest that this feature most likely is the residual circulation associated with a supercell storm that was overtaken by the convective system's larger-scale, accelerating gust front. In the figure, this gust front appears as a sharply-outlined, arc-shaped swath of light red and pink shades in the lower right part of the velocity panel. It marks the leading edge of an expanding outrush of cold air associated with a well-developed, high wind-producing convective system. (Note: The thin, straight, white lines are county boundaries; the counties are roughly 20 statute miles wide, providing a length scale for the circulations shown). When a derecho-producing convective system becomes particularly large and long-lasting, a larger-scale circulation known as a mesoscale convective vortex or "MCV" may develop. These vortices arise from localized pressure falls that occur in response to the concentrated release of latent heat (i.e., warming) that accompanies the development of deep cumulonimbus clouds. On occasion MCVs may grow in size to occupy an area as large as that of a typical Midwestern state; such circulations may last for more than a day and enhance the convective system's strength and longevity (e.g., the "Super Derecho" of 2009 previously mentioned). Smaller MCVs commonly form in weaker wind-producing systems. They often appear as swirls of residual mid-level clouds, or as bands of showers in radar imagery, long after the parent convection has dissipated. 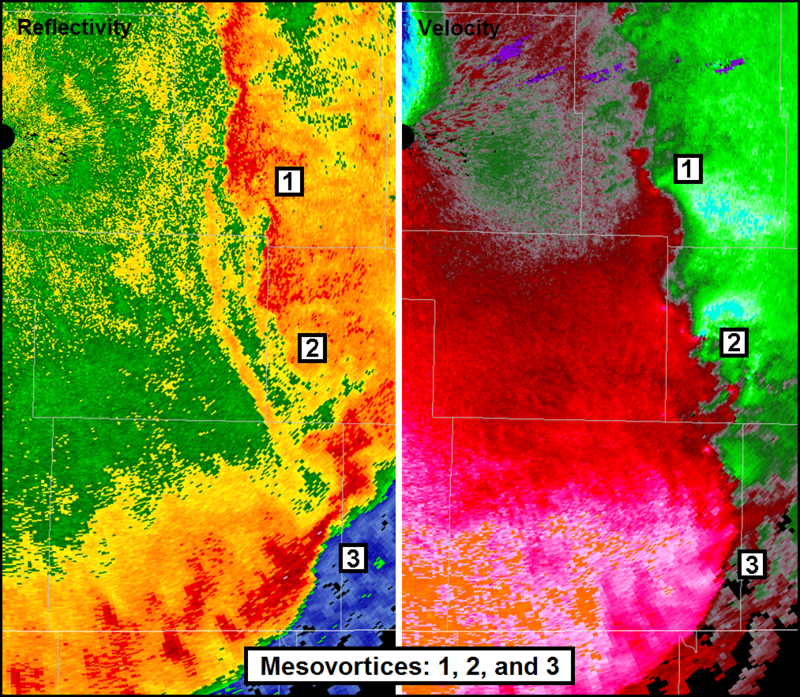 The radar reflectivity image below shows the very well-developed MCV associated with the "Super Derecho" of May 2009 as the circulation entered southwest Missouri from southeast Kansas. Once developed, it is the superpositioning of vortex-induced winds with those of the convective system's larger-scale outflow that can lead to corridors of enhanced damage in a derecho. Typically, with convective systems that form in the mid-latitudes where the mean tropospheric flow is westerly, this superpositioning yields the strongest winds on the equatorward side (i.e., the southern side in the Northern Hemisphere) of the vortices, where the wind fields are additive. An analogous additive effect accounts for the fact that the highest wind speeds in a hurricane generally occur in the storm's right front quadrant (when facing in the direction of storm motion). 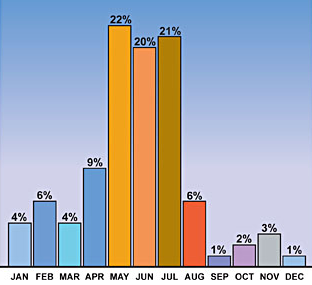 Derechos in the United States are most common in the late spring and summer (May through August), with more than 75% occurring between April and August (see graph below). As might be expected, the seasonal variation of derechoes corresponds rather closely with the incidence of thunderstorms. Given that the prevailing meteorological conditions favorable for derecho development occur with fair regularity over large parts of the continental United States each year, it is not surprising that the United States is one of the most derecho-prone regions of the world. 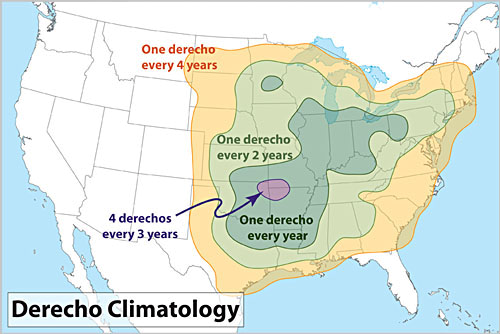 In this country, derechos most commonly occur along two axes, as shown on the map below. One track parallels the "Corn Belt" from the upper Mississippi Valley southeast into the Ohio Valley; the other extends from the southern Plains northeast into the mid-Mississippi Valley. During the cool season (September through April), derechos are relatively infrequent but are most likely to occur from east Texas into the southeastern states. Although derechos are rare west of the Great Plains, derechos occasionally do occur over interior portions of the western United States, especially during spring and early summer (e.g, see this case that affected parts of Utah and adjacent states on May 31, 1994). It should be noted that because of limitations in the data collection and compositing techniques used to create the derecho climatology map, the number of events depicted along edges of the domain, especially near the Canadian border, is somewhat less than the actual number observed. Additional climatological information on United States derechos is available here. While relatively uncommon, derechos also occur outside North America. Comparatively few, however, have been formally documented, and all of those in recent years. In Europe, a serial derecho occurred on July 10, 2002 over eastern Germany and adjacent portions of neighboring countries. The Berlin area was hardest-hit, with eight people killed and 39 injured, mainly from falling trees. Derechos in Finland, Spain and France, and Bulgaria also have been described. The Finland case was the first to have been documented poleward of 60 degrees latitude. The main factor limiting derecho development in Europe and other cooler parts of the world is the infrequent nature of elevated mixed layers (EMLs). In regions where EMLs are more common, derechos are more likely to occur (e.g., Australia and parts of Africa). In Bangladesh and adjacent parts of India, an intense type of storm known as a "Nor'wester" occasionally brings high wind and very heavy rain, usually in spring. Based on event descriptions and the meteorological environments involved, it appears that at least some "nor'westers" are, in fact, progressive derechos. A common question of late is how climate change or, more specifically, global warming might affect derecho frequency, strength, and distribution. Given that earth's atmosphere always has been in a state of change, and that the time scales of climate change are very long relative to human lifespans, questions of this type are more academic than practical. A warmer planet at first glance would appear to be more conducive to the development of the intense thunderstorms that comprise derecho-producing convective systems. But thunderstorm updrafts require the presence of strong vertical temperature gradients; any warming that occurs at the surface likely also would occur aloft. Thus, the net change in instability --- that is, the net change in the potential for strong updraft development --- likely would be minimal. In addition, although a warmer environment implies greater atmospheric moisture content and conditional instability (instability related to the release of latent heat during condensation; this is the type of instability that fuels a hurricane), all other factors being equal, the increased moisture also would yield more widespread low-level clouds. Such cloudiness would negatively impact storm initiation and derecho development. There is nothing to suggest that a warmer world necessarily would favor stronger derechos. This is not only because vertical temperature differences likely would remain unchanged but also because derecho development requires the favorable coexistence of many interacting environmental factors over various scales of time and space. In particular, the small-scale processes involved in the initiation of individual storms --- and their growth and organization into long-lived mesoscale convective systems --- are incompletely understood. For this reason these processes are only crudely represented in both short-range (day-to-day forecast) and long-range (climate) numerical models. For example, increased moisture theoretically would be available for cloud and storm development in a warmer world. Increased cloud water content, in turn, generally enhances downdraft strength (through "water loading"). But it does not necessarily follow that storms with water-enhanced downdrafts would be more favorable building-blocks of derechos; if the downdrafts are too strong or ill-timed, their presence could short-circuit derecho development. What can be said with greater certainty about derechos and climate change is that the corridors of maximum derecho frequency likely would shift poleward with time. This is because the bands of fast upper-level winds that arise from the equator-to-pole temperature gradient --- the jet stream --- would contract poleward in a warmer world. Because derechos tend to form on the equatorward side of jet streams, especially those that mark the northern fringes of warm high-pressure ("fair weather") systems, the areas most favored for derecho development also would shift poleward. It is unclear, however, how jet stream changes might impact derechos from a wind shear perspective. While derechos are not as sensitive to wind shear (changes in wind speed and/or direction with height) as are, for example, tornadoes, some degree of vertical shear is necessary for long-lived derechos. Because the most favorable wind shear environments are tied to the location of the jet stream, it seems reasonable to conclude that, overall, potential changes in shear would not appreciably impact derecho incidence or severity. Another frequent question regarding derechos is whether or not their approach may be identified by characteristic cloud formations. The short answer is "No." Although some derecho-producing convective systems are indeed preceded by well-defined shelf or arcus clouds along the progressive portions of their gust fronts (recall examples shown at the top of this page), these formations are not always present. This is because the local wind and thermodynamic conditions that give rise to shelf clouds typically change appreciably over space and time. While the environment might favor the development of such clouds at some point during the life of a given event, it is uncommon for these conditions to exist everywhere and at all times during its existence. In addition, environments that give rise to dramatic shelf clouds sometimes appear when the larger-scale weather pattern is not favorable for derecho development. As a result, striking shelf clouds on occasion occur in conjunction with relatively benign thunderstorms. 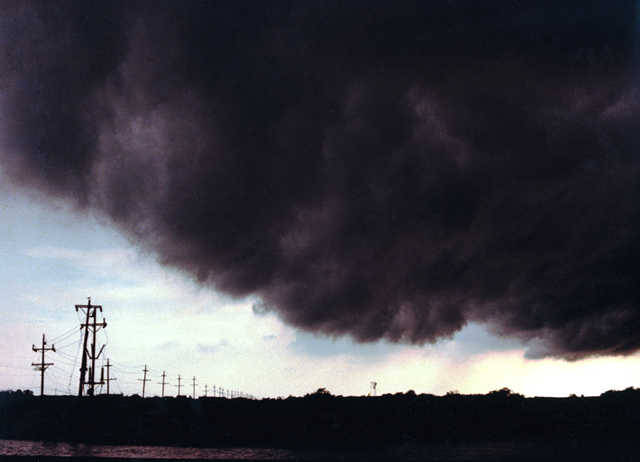 For example, the following image shows a turbulent, low-hanging shelf cloud that accompanied a small but intense cluster of thunderstorms near Ventnor, New Jersey on July 24, 1979. The winds aloft were comparatively light and not favorable for organized, sustained storms. But moisture-rich air in the lower levels and convergence (uplift) along sea-breeze boundaries contributed to circulations that briefly gave rise to an impressive shelf cloud, in addition to very heavy rain. Arguably some of the most dramatic and longer-lasting derecho-induced shelf clouds appear over the Great Plains. This, in part, reflects that region's proximity to the western United States plateau and its associated elevated mixed layer air, or EML, previously discussed. A very strong temperature inversion or "cap" that marks the base of the deep EML commonly is present over the Plains states on days when derecho-producing storms arise there. It is this inversion that contributes to the development of marked shelf-type accessory clouds as cool thunderstorm outflow winds force warm, humid, low-level air to rise through the stable layer. On occasion, more than one inversion and/or moisture discontinuity may be present near the base of EML. These environments are the ones that sometimes give rise to particularly menacing, multi-tiered shelf formations such as the one shown below. 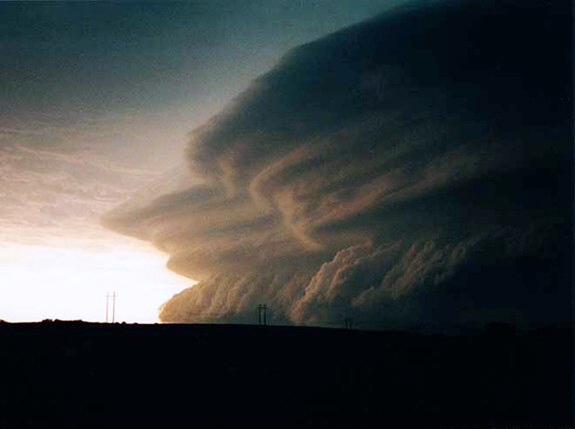 This photograph was taken near Fort Supply, Oklahoma as the intense "Southward Burst" derecho of May 27, 2001 approached from the north. Additional images from this event are available here. Whether or not a notable shelf cloud develops, the exceedingly dark aspect presented by the leading edge of many derechos largely is due to the blocking of sunlight by the deep and often horizontally-extensive clouds that comprise the parent storm system. During spring and summer this blocking effect is accentuated around sunset for east or southeast-moving storms as the low sun angle at that time maximizes the path taken by sunlight through the clouds. The high "optical density" of rapidly-growing cumulus and cumulonimbus clouds is another reason approaching derechos appear dark. Greater concentrations of small water droplets are present in vigorous convective clouds, where rapid condensation is taking place, compared to those in weaker cumuliform clouds or stratus types. Small droplets back-scatter (reflect) incident sunlight very effectively, allowing very little indirect light to pass through. As a result, derecho-bearing squall lines tend to be especially dark and foreboding when they lie between the observer and the sun. 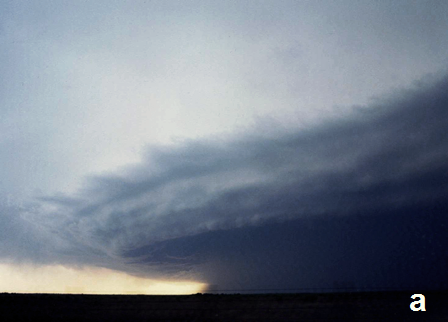 This is the case with the early evening sequence shown below, photographed near Vernon, Texas in April 2000. Many significant derechos (i.e., those that have caused severe damage and/or casualties), have occurred over North America during the last few decades. Most of these affected central and eastern parts of the United States and Canada. Linked below are brief summaries of some of these events. The list is not all-inclusive, and additional cases will be added as time permits. Information includes a map of the area affected, a description of the storm's impact and meteorology, and, where available, links to additional information. The Storm Prediction Center's severe weather report data base was examined to identify those severe weather events that involved widespread damaging winds associated with convective storms in the years 2004 and 2005. These events include all the derechos that occurred over the continental United States during that two-year period. Hyperlink maps were created to show the approximate path for each event. The maps link to a display of all severe weather reports and locations in the Storm Prediction Center data base for the day of the event. The records are preliminary and do not include official National Weather Service final storm report information listed in Storm Data; the data also do not include reports from Alaska and Hawaii. The maps do, nevertheless, provide a general idea as to the typical geographical and seasonal distribution of severe wind-producing events in the United States. Information on significant derechos that have occurred since 2005 will be added, on a time-permitting basis, to Noteworthy Events. Here is a list of selected of research papers on derechos and the convective systems responsible for their development. In addition to presenting analyses of some well-documented events, these papers describe what is known about the formation and mechanics of derecho-producing convective systems. In the mid-1990s, the Atmospheric Environment Service of Canada assembled a video that documents the passage of a progressive-type derecho through the Pakwash forest of northwest Ontario on July 18, 1991. The video includes camcorder footage of the storm affecting a forested area, post storm aerial views of the forest "blowdown," and interviews with people who experienced the event. While the video clips were made some time ago, they remain useful in providing insight into the impact a derecho can have in real-time, . Many people assisted in preparing "About Derechos" by providing photos, images, stories, suggestions, and other information. Their assistance was very much appreciated. From Environment Canada: Phil Chadwick, Rene Heroux, Mike Leduc, Serge Mainville, Brian Murphy, Peter Rodriquez, Sarah Scriver, Dave Sills, and Pierre Vaillancourt. From the U.S. National Weather Service and National Severe Storms Laboratory: James Auten, John Cannon, Ariel Cohen, Mike Coniglio, Sarah Corfidi, Mark Darrow, Greg Dial, Chuck Doswell, Roger Edwards, Randy Graham, Jared Guyer, John Hart, Victor Homar, David Imy, Sarah Jamison, Ed Jessup, Rusty Kapela, Steve Keighton, Richard Koeneman, Norvan Larson, Jeff Last, Jay Liang, Patrick Marsh, Dan McCarthy, Corey Mead, Peter Parke, Steve Pennington, Tom Reaugh, Kevin Scharfenburg, Russ Schneider, Todd Shea, Rich Thompson, Frank Wachowski, Jeff Waldstreicher, Steve Weiss, and Mike Wyllie. Others who assisted include: Curtis Alexander, Bert Barnes, Karen Bennett, Marlin Bree, Dave Crowley, Lee Grenci, Botchy Grimm, Dave Lewison, Chouga McGuire, Pete Pokrandt, Colin Price, Kristina Reichenbach, and Robert Schlesinger. Special appreciation is extended to Dennis Cain for the base schematic illustrations that appear in "Derecho-producing storms," "Derecho development," and "Derecho climatology," and are used in the National Weather Service's Jet Stream Online School for Weather.